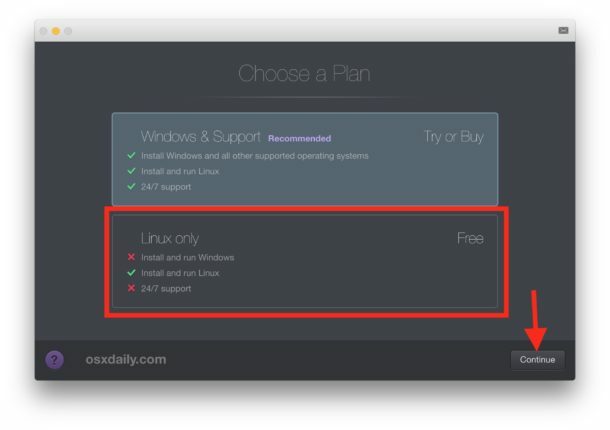 Tried the app out a few weeks ago but found it wouldn’t let me install macOS Sierra but I didn’t know until now that you had to use the “Linux Only” option. This is nice, I didn’t know about Parallels Desktop Lite. You can also run MacOS in Vmware and VirtualBox, with Virtual Box you have to use an ISO or boot drive to boot though. And all of them run Windows. You can also run Windows natively with Boot Camp for best performance. This is fascinating, especially for someone who has never messed around with VM before. I have been wanting to upgrade to Sierra from El Capitan but Intuit says my Quickbooks Pro 2014 for Mac won’t run on Sierra. Most other applications of importance will. But since QB is critical to me, and I don’t want to shell out another $200+ to Intuit for the privilege of continuing to run 2-yr-old software, I haven’t upgraded. 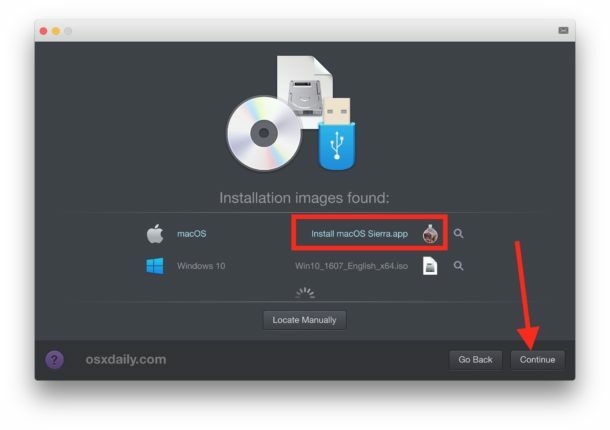 So, my question is, just so I’m clear: if I do this install of the VM on El Capitan, and then install Sierra (as you’ve done in your example), can I make Sierra my PRIMARY OS (operating from within the VM) and just switch back to El Capitan when needed to use QuickBooks and any other apps that won’t play nice with Sierra? And when further upgrades come, continue to do those within the VM? Hope that’s clear. Sounds as if this is possible, but would just like to clarify and know that’s correct before I start messing around. Thanks. I look forward to your response. It might be better to upgrade your real machine to Sierra, and then install El Capitan in your VM. That way, everything except your back level QB will run in your primary machine. Great suggestion. To be clear, would I then need to re-install those apps (such as QuickBooks) that I’d want to run via El Capitan on the VM? Is there any way in the installation process to essentially point the VM to the already existing El Cap set up? Thanks again for your suggestion, as I hadn’t really thought about that option. But it does raise new questions. Any thoughts would be welcome. Thanks again! 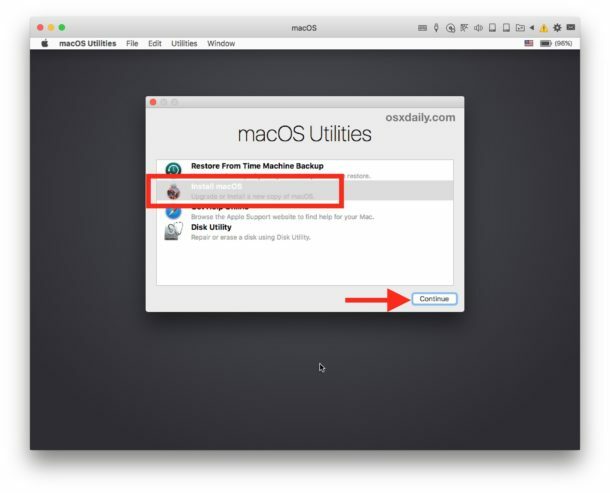 You could make a time machine backup of your current El Capitan system to an external drive, then update your system or do a clean install of Sierra. Once that is done complete this VM project using El Capitan and during the installation select migrate from a time machine backup so you get all your stuff back including QB and your settings in your new VM environment. 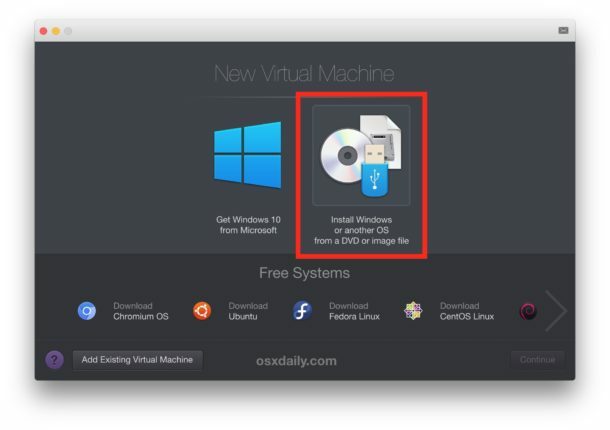 If you don’t want all of that stuff in your VM environment then just backup your QB data from your current system to somewhere safe, install QB in your newly installed El Capitan VM environment and load from you backed up QB file. 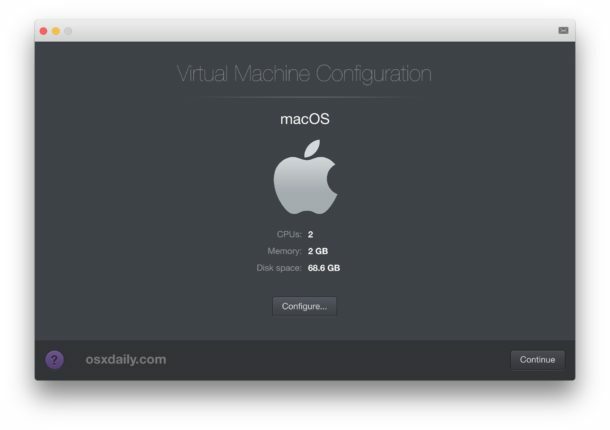 You could certainly install Sierra into a VM with this method and use it, experiment with it, but because Mac OS is running on virtualized hardware you will find performance is limited and less than you’d experience in a true native booting environment. I tend to feel that virtual machines are at best 1/2 of the speed of running natively on a computer, maybe even closer to 1/4 the performance or sometimes even less. Virtualization and VM’s are helpful for testing, but I wouldn’t want to run everything within one full time for heavy duty needs. 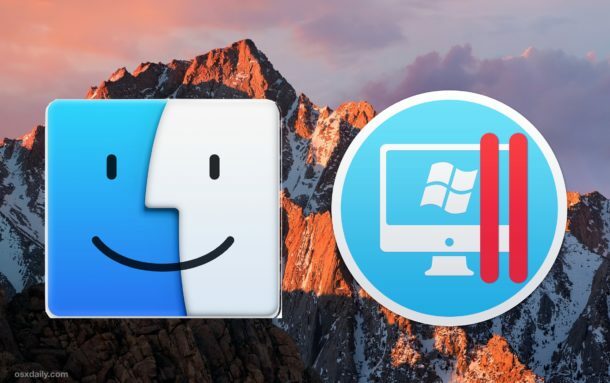 My personal recommendation is stay with the Mac OS version that is compatible with the apps you need, if QB is critical and only compatible with El Cap than I would stay put. I run El Cap on one of my Macs and Sierra on another. Again, appreciate the insights and recommendation. I’d like to install Snow Leopard from the DVD into a virtual machine using Parallels Lite but it won’t recognize the install from a DVD. Suggestions? It sees the DVD but says I can only install OS X Server Snow Leopard (which I don’t have). When I ordered, the sales rep wasn’t even aware they still offered this product. I ordered in Jan 2017. I was able to install Sierra and El Capitan in this easily, but Snow Leopard EULA doesn’t allow virtualization if I remember correctly, though SL does install in VirtualBox… VirtualBox is also free you could try that, it’s from Oracle. Ray S., I’d try copying the files from the DVD to a USB flash drive and use that as the source. Stewart, the Sierra install is in a separate environment – none of the installed apps are available, unless you install them under Sierra. Thanks for that info. Pretty much what I thought but glad you verified it. Much appreciated. How far back could one actually go? For instance, on an old laptop I still have System 9, with Classic. This allows me to open files back to PageMaker 4.5 in Classic and in PageMaker Version 7 and then transfer to open as InDesign files in CS6 and then in CC2017. In my 30 years of book publishing I now find increasing calls for very old books to be made into eBooks and this has been a great benefit. But one day the laptop will fail and if I can use this process it would be wonderful. But this may be a leap Back to the Future too far… I think I recall that nothing that far back will work on modern platforms. Virtualization is limited to intel CPU I believe so that would be mid-release Mac OS X releases and newer, though it would be great to have a Mac Classic emulator with System 7, 8, and 9! Check out sheepshaver. This is a virtual machine for Mac classic. It works very well! 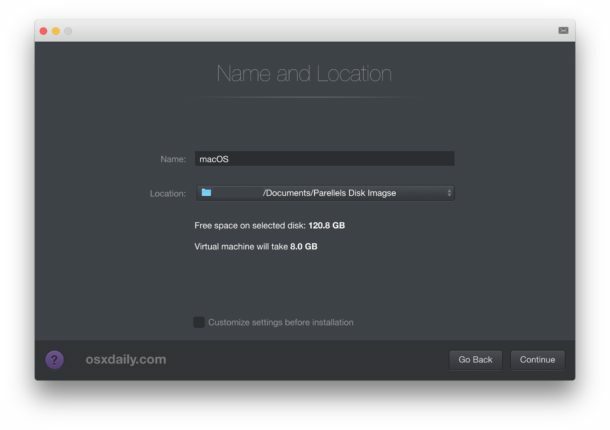 How much storage space does the Sierra VM take up after it is installed? In order to use Snow Leopard via virtualization, you must have Snow Leopard Server due to EULA requirements. I believe you can still order a DVD of SL Server from Apple for around $20 if you call and ask nicely. 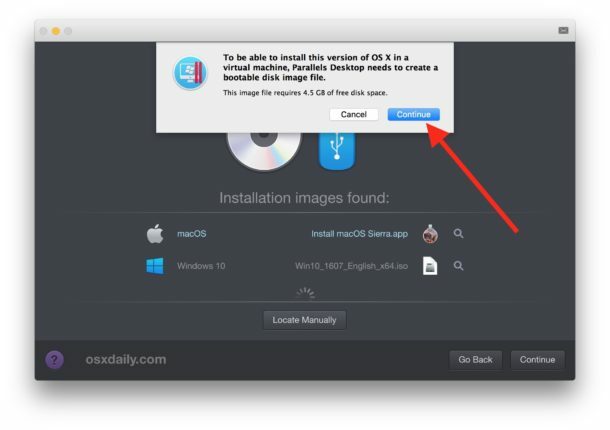 There are lots of tips online (search for it) on how to install SL Server on Parallels. I use it myself. 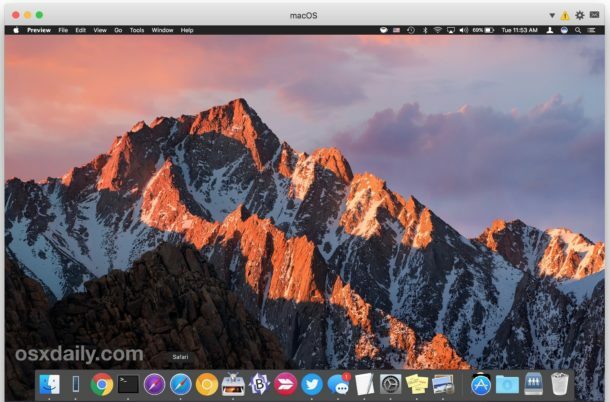 You’ll find all the information you need to install Sierra on unsupported Macs here. Works like a charm. Why don’t you just do hackintosh!!! 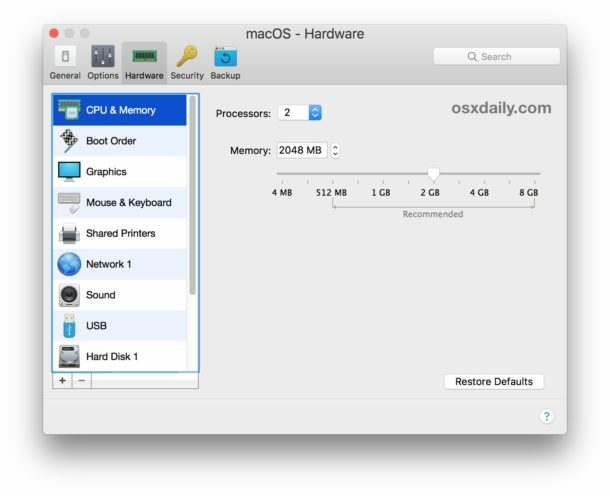 more hackintosh articles please! I’m not following how I can use wifi in the virtual machine, do you have any instructions for this configuration? Mine setup automatically with wi-fi. Internet connectivity should pass through and work immediately in the virtual machine, whether wi-fi or ethernet. I try loading yahoo via safari and the progress bar stops midway through trying to load the site. I’ve installed parallels_lite on a macbook pro running sierra and installed sierra on my virtual machine. Parallells often makes my machine crash. Well yes, Windows 7 is not Mac OS. You can run linux or Mac OS free in Parallels Lite. You can run Windows 7 in VirtualBox free for eternity, however. You can run Windows 10 for ever in VirtualBox too. Yes, but there are some problems with the network when I’m running Citrix XenCenter on Virtualbox and VSphere Client, Parallels don’t give me any errors. So, I guess I’ll try to purchase it. The parallels website states that their software will not run on anything older than 2011. I was able to run it on a 2010 MacBook Pro, 2010 Mac Pro – but not a 2009 Mac Pro. I followed the instructions but it wants to install ONLY on my main partition NOT onto a virtual disk image drive – am I doing something wrong? I need to do this to check an application from a less-than-possibly-trustworthy source. Will the VM of macOS protect my root OS from any nefarious code in the app?